The terrorist attacks on two mosques in New Zealand by a far-right extremist from Australia have triggered fresh debate about the roots and sources of far-right radicalization. One narrative has focused on Brenton Tarrant’s apparent ties to extremist, online sub-cultures, characterized as much by their proclivity to hate speech and conspiracy theories as for memes, trolling and what has become known as “shitposting”. While this is doubtlessly one aspect of Tarrant’s radicalisation, his own writings make clear that a genuine, real-world ideological framework informed his murder spree. Understanding this is key to helping policymakers, law enforcement, and social media platforms prevent similar attacks in the future. Central to Tarrant’s worldview appears to have been a commitment to the so-called “Great Replacement” theory. This conspiracy theory posits that Muslim immigration to Western countries is a secret plot to “outbreed” white Christians of European ancestry and thus take over their “homelands”. A peculiar brand of Islamophobia, it is rooted in anti-Ottoman sentiment. Tarrant’s arrival at these beliefs appears to have occurred through one specific ideological prism – his familiarity with and interest in Serbian ultra-nationalism. In the 1990s, the Serbian strongman Slobodan Milosevic engineered a series of wars in Slovenia, Croatia, Bosnia and Herzegovina and, finally, in Kosovo. From 1987 to 1990, he had attempted to seize control of Yugoslavia’s complex federal state. When this failed, he shifted to carving a “Greater Serbia” out of the wreckage of the Yugoslav federation. His regime spent much of the decade from 1991 to 1999 at war, trying to ethnically cleanse non-Serb communities from Croatia, Bosnia and Herzegovina, and Kosovo, and to absorb these lands into Serbia. The high-water mark of this project was the Bosnian Genocide, a campaign of extermination and expulsion that targeted Bosnia’s Bosniak Muslim community in particular. Bosniaks, and later ethnic Albanians in Kosovo, were targeted because, in the Serb ultra-nationalist mythology that Milosevic’s regime embraced, they were Muslims whose religious ancestry dated back to the Ottoman conquest of the Balkans in the 15th century. In this narrative, Bosniaks were, in fact, ethnic Serbs who had “abandoned” or “betrayed” their ancestors by converting to Islam. They were, therefore, traitors as well as enablers of Ottoman rule in the region – which lasted for nearly five centuries. For these Serbian nationalists, the extermination of Muslims in Bosnia and Kosovo was a morality tale, avenging centuries of perceived injustice at the hands of the Ottomans. They saw themselves as engaged in an attempt to defend Christendom and rid it of an alien element that had taken root in Southeastern Europe. How do we know that Tarrant was familiar with this narrative? He tells us so. In his manifesto, he directly refers to the Serbian nationalist cause in the 1990s as “Christian Europeans attempting to remove…Islamic occupiers from Europe”. His rifle and ammunition were marked with the names of medieval and 19th-century European leaders known for their anti-Ottoman campaigns. Especially pronounced among these are figures from Serbian and Montenegrin history: Prince Lazar, Milos Obilic, Marko Miljanov Popovic, Bajo Pivljanin, and Novak Vujosevic. On his way to commit the murders, he also played a Serb nationalist song glorifying the Bosnian Serb war criminal Radovan Karadzic. That same song is the premise for a popular far-right meme dubbed “remove kebab” or “Serbia Strong”, which calls for the “removal” of Muslims. In his manifesto, Tarrant refers to himself as a “kebab removalist.” Likewise there is evidence to suggest that he visited Bosnia and Montenegro, and possibly Serbia, to tour various battle sites. He also clams in his manifesto to have drawn “true inspiration” from Anders Breivik, the neo-Nazi who killed 77 people in Norway. What is striking about Breivik’s manifesto also is what the UK Economist referred to as his “strange obsession” with the Balkans. His 1,500-page “European Declaration of Independence” contains nearly 1,000 direct mentions of the Yugoslav wars of the 1990s. 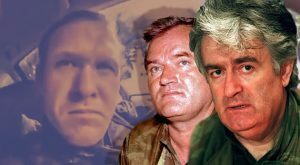 Karadzic, who was first convicted of genocide and crimes against humanity in 2016 and then given a life sentence at the Hague war crimes tribunal on Wednesday, is singled out for special praise. Anyone who has researched the rhetoric and narratives of contemporary white supremacists will know also that this fixation with Serb nationalism is not isolated to Breivik and Tarrant. Its narratives and violent culture have become an ideological pillar for many present-day far-right extremists, along with Nazism and the Holocaust, the apartheid regimes in South Africa and Zimbabwe, the Confederacy in the US, and other racist-nationalist movements. Meanwhile, contemporary Serb nationalists such as Milorad Dodik in Bosnia, enjoy widespread support among European far-rightists. The source of Dodik’s popularity among Western reactionaries is his own virulent Islamophobia, his draconian anti-refugee policies, his close ties to the Russian financial patrons of the European far right and, above all, his steadfast denialism of the genocide in Bosnia. In essence, Dodik has taken up the mantle of being a latter-day Karadzic, and has won the admiration of the far right in the West as a result. The Western far right has latched on to Serb ultra-nationalism because, in their collective imaginations, the Yugoslav wars were the opening salvo in a civilizational conflict between the white Christian West and the Islamic East. This narrative is often appended to a fixation with the Crusades as the first chapter of this millennial contest. Accordingly, Milosevic and Karadzic and the Greater Serbia project are recast as latter-day Byzantines, “defending Europe” from Islamic invasion. Equally important to the Western far right in this regard is both that these conflicts occurred before 9/11 and the onset of widespread Western concerns with Islamic extremism, and that NATO sided “with the Muslims” in the Balkans. To Tarrant and Breivik, Milosevic, Karadzic and their associates understood the true nature of the Islamic threat and also understood that genocide is the only way to deal with the threat. Yet the West betrayed these Christian heroes, bombing them in Bosnia and Kosovo for taking a courageous stand against the invaders. The 9/11 attacks and everything that has followed showed the foresight of Milosevic and his pogroms, they argue. That is why NATO, in its current form, which rejects the idea of a civilizational struggle against the Islamic world, must be imploded. However bizarre and historically illiterate, we must understand these claims. This is because, in comparison to many of the above examples, while Serb nationalist mythologies are less known and understood in the West, they have become ever more prominent in the worldview of the Western far right. As law enforcement and social media companies seek ways to identify and de-platform extremist online and real-world hubs, recognizing the tell-tale references and iconography of Serb ultra-nationalism may help root out these individuals. Jasmin Mujanovic is a political scientist specializing in the politics of Southeastern Europe. His first book, ‘Hunger and Fury: The Crisis of Democracy in the Balkans’, is now available.